Halitosis is a common problem. There are many assessment methods in the literature as well as treatment modalities. The objective of this systematic review is to evaluate the level of evidence for each treatment modality of halitosis. 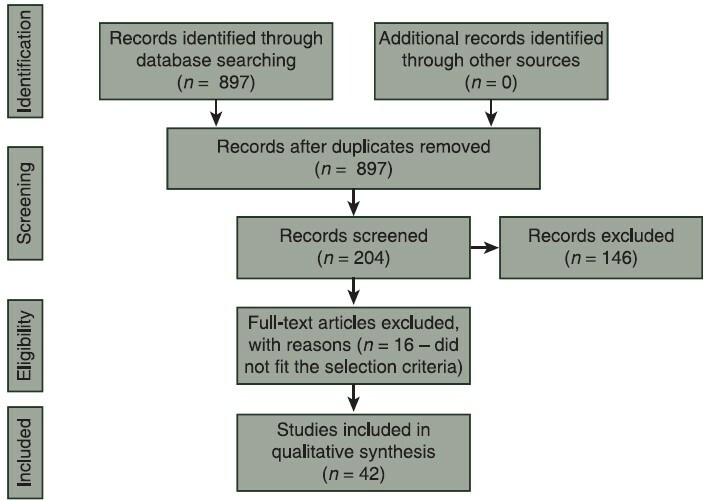 Electronic databases were searched in a systematic method according to preferred reporting items for systematic reviews and meta-analyses guidelines. The review included human clinical trials with or without randomization and excluded case reports and case series. Only articles written in English were included in the review. Forty-three articles were included in this review. It was found that treatment modalities can be classified into chemical compounds in mouthwashes, chemical compounds in dentifrices, chemical compounds in other products, herbal products and combinations of chemical and physical methods. The level of evidence ranged from I to IV for each class. This review suggests that mouthwashes and dentifrices are the best ways to combat halitosis. There is currently insufficient amount of level I evidence to support the efficacy of herbal products or mechanical modifications to oral hygiene practices and there is a need for a greater number of randomized controlled trials to study the efficacy of these methods. Background and Objectives: Evidence has accumulated linking the effects of licorice for the treatment of many diseases. The objectives of this study were to evaluate the antibacterial action of licorice root extract against Staphylococcus aureus and to study its healing potential on the experimentally induced oral wounds in the rabbit's cheek mucosa. Materials and Methods: Different concentrations of licorice root extract were prepared and their antibacterial activities against S. aureus determined by disk diffusion method. The wound had been created using of biopsy punch at the right cheek mucosa of the rabbit. In the study group, these wounds were irrigated with 1 ml of 60 g/100 ml of licorice root extract twice daily. Seven rabbits from the control and the study group were sacrificed in the 3 rd and 6 th day of the experiment, and biopsies were taken for histological observations of the wounds. Results: There was no sensitivity of S. Aureus to different concentrations of licorice extract. The histological features of oral wounds in the study group showed satisfactory healing potential after twice daily irrigation with 60 g/100 ml of licorice root extract in comparison to control group. Conclusions: Different concentrations of licorice root extract has no antibacterial action against S. aureus, but licorice can shorten the healing time of the induced oral mucosal wounds in rabbits. Introduction: The current study was initiated in order to evaluate the students' perception of an electronic dental record (EDR). Materials and Methods: A digital based survey questionnaire was developed and validated for evaluating the EDR system. The questions covered the demographic data, addressed the perceptions of the students to the system and the extent of students' satisfaction toward the system. Results: A total of 290 participated with a response rate of 48%. The results indicated that there was a presence of positive attitude among students toward the EDR system leading to an increase in the level of satisfaction with the system. There was a significant difference between the average satisfaction for male and female students for the benefit of male students, with an average satisfaction score of (4.09) compared to average satisfaction score of (3.74) for female students. Conclusion: The survey has noticed an increase in quality of patient care due to improved oversight of patient management and the ability to more efficiently monitor treatment outcomes. By providing a coordinated delivery of clinical services, the EDR system has been accepted as an enabling technology that allows users to pursue more advanced practices than would be possible with paper-based records. 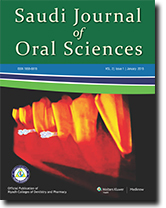 Purpose: The aim of the present investigation was to assess and compare the oral health-related quality-of-life (OHRQoL) in the rural and urban chronic periodontitis patients of Punjab using short questionnaire of oral health impact profile (OHIP-14). Materials and Methods: A total of 100 patients suffering from chronic periodontitis with pocket depth ≥4 mm in at least one proximal site and a minimum of 20 teeth were screened and divided into two groups - rural and urban (50 participants in each group). Clinical parameters, that is, plaque index (PI), gingival index (GI), pocket probing depth (PPD), and OHRQoL were assessed in all patients using OHIP-14 questionnaire. Results: Results showed that mean PI (2.11 ± 0.635), GI (1.61 ± 0.45), PPD (3.12 ± 0.692), and OHIP-14 (11.49 ± 9.733) scores were significantly higher in the rural population as compared to urban population (1.69 ± 0.45, 1.56 ± 0.355, 3.30 ± 0.973, and 5.88 ± 5.588) suffering from chronic periodontitis. 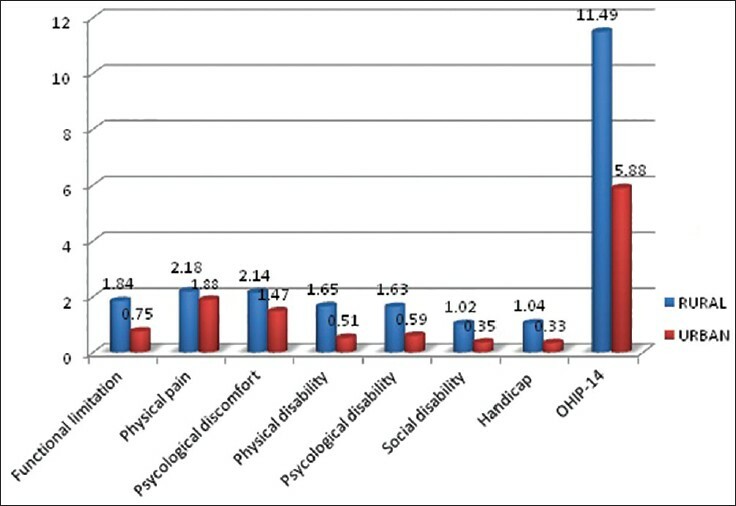 Most affected domain in case of the rural population was functional limitation whereas psychological disability was most affected in the urban population. Statistically significant positive correlation was observed between the periodontal parameters and OHIP-14 (P < 0.001) in both the groups. Conclusion: Within the limitations of the study, periodontal status and OHRQoL are significantly correlated with each other in both rural and urban groups. Objective: The objective of this research was to investigate the knowledge of general dentists about the emergency management of dental avulsion in Sana'a, Yemen. Materials and Methods: A questionnaire containing nine questions about emergency management of avulsed teeth was distributed among 416 general dental practitioners working in different private dental hospitals and clinics of Sana'a among them 272 was responded. Results: Among the studied group, (44%) said that an avulsed permanent tooth cannot be replanted. Sixty-eight percent of the responded informed that they use rigid splint for avulsed tooth and 29% said that semi-rigid splint should be used. Conclusion: The results suggest that the level of knowledge on the management of dental avulsion of the general practitioners dentists in Sana'a is inadequate. An education program should be conducted to increase the knowledge of general dentists in the management of traumatic injuries to teeth. Background: Traumatic dental injuries (TDIs) have been reported to be a low priority of emergency room (ER) personnel; however there have been increased calls from across the world to train ER personnel in the provision of dental trauma first aid (DTFA). Aim: The aim was to measure the knowledge and attitude of a sample of ER physicians, nurses and emergency medical technicians (EMTs) from across Saudi Arabia regarding DTFA. Materials and Methods: A structured questionnaire was modified from previously existing questionnaires on the topic. A stratified, cluster sample was designed by randomly selecting hospitals across four regions of Saudi Arabia. A total of 150 questionnaires was distributed to all the ER personnel of these hospitals of which 146 completed responses were received. Results: The overall knowledge scores ranged from 0 to 6 out of 7 (mean score 2.88 ± 0.55). Surgeons had the best knowledge about DTFA while EMTs had the lowest knowledge. Nurses had the most positive attitude toward the management of DTFA. Regression models showed that specialty of the personnel and previous education about DTFA significantly influenced knowledge while witnessing a TDI was the only factor that significantly influenced attitude. Conclusion: Overall knowledge of DTFA among ER personnel across the sampled regions of Saudi Arabia is low. 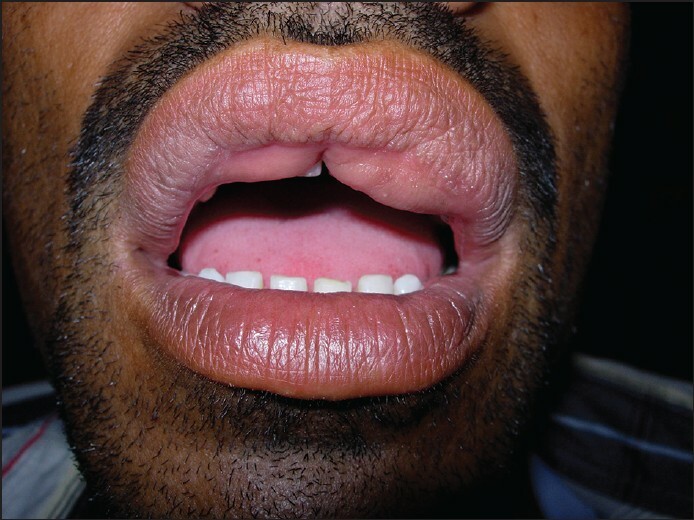 Double lip is a rare anomaly that may be congenital or acquired and affects upper lip more commonly than the lower lip. This deformity consists of an accessory fold of redundant mucous membrane inside the vermilion border. It affects esthetics and may also interfere with speech and mastication. Simple surgical excision produces good functional and cosmetic results. We describe a case of congenital maxillary double lip along with a brief review of the literature and discuss the differential diagnosis. This anomaly is of more relevance in dentistry as a general dental practitioner is usually, the first professional to recognize and establish the diagnosis. Cystic hygroma is an uncommon type of benign neoplasm of lymphangioma commonly seen in children, rarely reported in adults. Most of the cases occur in head and neck region. The etiology and pathogenesis of this entity are still unclear. Clinically, they present as painless, soft, compressible, progressively enlarging mass. Various treatment methods have been described, but surgery remains the treatment of choice. Incomplete excision results in recurrence. 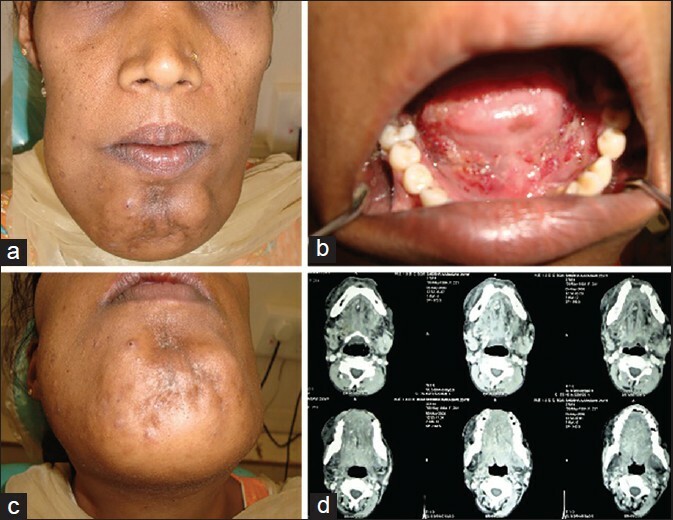 We present a unique case of bilateral submandibular area cystic hygroma in an adult female patient with a history of recurrence twice. Purpose: Prosthodontic rehabilitation of elderly patients with severely resorbed ridges is difficult due to compromised ridge height, increased inter-arch distance and altered insertion of associated jaw muscles. Planning dentures in such cases often require dentures that are lightweight to reduce the risk of further ridge resorption, which could otherwise complicate the situation. 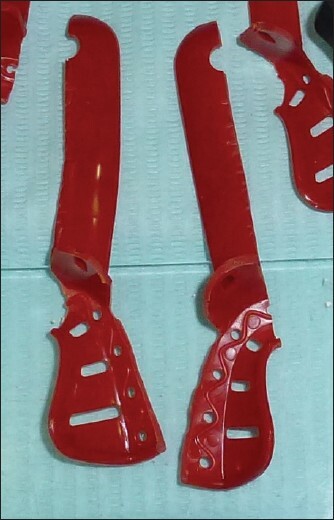 The purpose of the present technique is to fabricate a light weight lower denture by a revision of previously described technique in the literature. 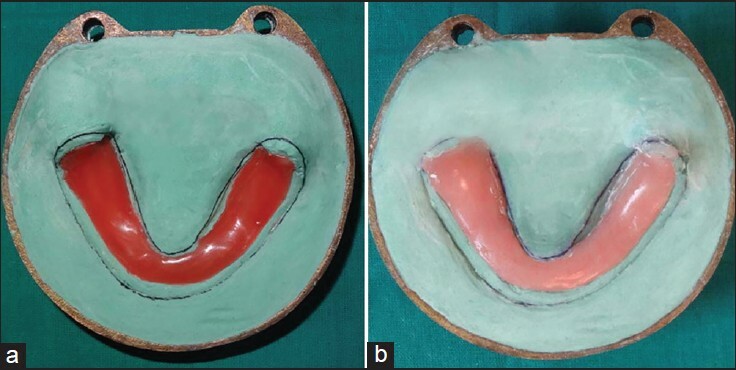 Materials and Methods: This article elucidates a simple technique for the fabrication of lightweight denture (hollow denture) in elderly patients with severely resorbed mandibular ridge. The minimum thickness of denture base acrylic resin for structural durability is ensured by a wax shim of 2 mm. The adequate hollow space indenture for optimal weight reduction is created by condensation silicone impression material. Conclusion: Condensation silicone putty material can be successfully used as a spacer for hollow dentures to combat severe ridge resorption. The use of mini-implants in anchorage control during orthodontic treatment has gained popularity over the past decade. While several factors have been attributed to the success of these implants, the risk of root damage due to inaccurate placement has been a major issue. Therefore, several techniques have been developed to improve the accuracy of placement of these implants. A quantitative comparison of these techniques has been difficult. Micro-computed tomography (micro-CT) is similar to CT but has an infinitely greater resolution. This short communication explores the possibility of the use of micro-CT as a method of assessing root damage caused by the placement of orthodontic implants. Stainless steel crowns are the restoration of choice for the treatment of badly decayed posterior teeth under general anesthesia. The evaluation of occlusion after the placement of these crowns, however, remains a difficult task. 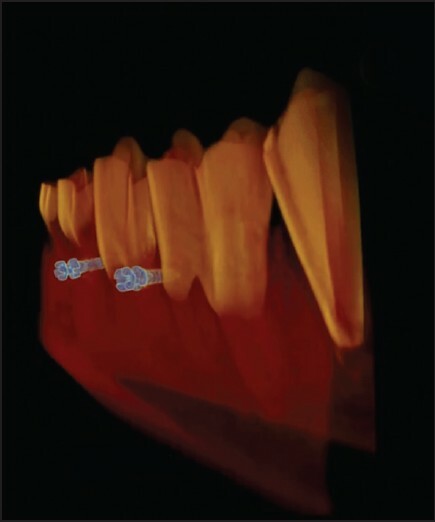 This paper outlines a technique to evaluate the occlusion of stainless steel crowns placed under general anesthesia using a specially designed tray and a fast setting polyvinyl siloxane bite registration material (Regisil® PB™, Dentsply, Surrey UK).